Dallas, April 2, 1957. Looking southwest from the 31st floor of the Republic National Bank Bldg. in downtown Dallas. The area between the smoke stacks and the white grain silos on the right is the approximate location of the present day American Airlines Center. 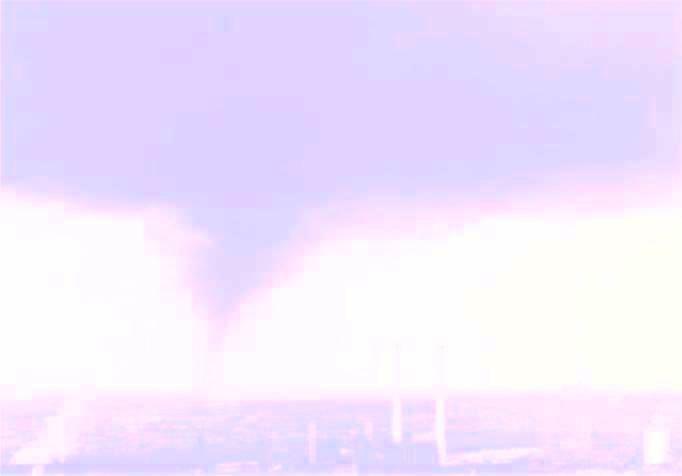 The more prominent building on the horizon is Parkland Hospital (the old one -- but at that time new), to the far side of which the tornado shortly will pass. The tornado is near to or on Vilbig St. The 1957 Dallas Tornado might easily be dismissed as just one out of scores of common Texas twisters, each in its time having done some damage and, perhaps, killed a few unfortunate people. The Dallas tornado was no monster to rival, for instance, the F4 that ravaged Wichita Falls in 1979. Retrospectively it has been determined to have been a category F3 (the original Fujita-Pearson scale was not developed until 1971). As it carved a sixteen mile path through Oak Cliff and West Dallas over a time span of about forty minutes, it took the lives of ten people, including three children from a single family (the highest death toll from a tornado to date in the DFW area), injured approximately 200 and left 500 homeless. Five-hundred seventy-four structures were damaged, including between 131 and 154 homes and between 9 and 28 apartment buildings that were completely destroyed. Property losses totaled $4 million (in 1957 dollars). It was one of about twenty-five tornadoes spotted around north central Texas and southern Oklahoma that day. However, the Dallas tornado historically is quite significant. By the time of its first appearance the rains that preceded it mostly had passed on, so that the air was washed clean and the funnel was not particularly obscured by precipitation. Rainfall from the thunderstorm that gave it life also was generally sparse. Although sky conditions were overcast and threatening, there were no especially low clouds to impede viewing. The tornado did not strike in a sparsely populated rural location, but rather in the middle of a relatively large metropolitan area. It did not strike at night, but late on a Tuesday afternoon when many people were out and about to witness it. It did not come and go quickly, but was deliberate -- almost leisurely -- in its passage. All of these circumstances conspired to make it by far the most filmed and photographed tornado up to its time(1). Photographs were made by 125 persons, and film footage ran to 2000 feet. Much of the latter was of sufficient quality (some of it exceeded only in the last fifteen or twenty years as storm chasing and video recording of tornadoes became common) to allow meteorologists to carefully plot debris movement, and thus, for the first time, obtain reliable estimates of the very high wind velocities associated with severe tornadoes. Also, although most of the damage was to houses, because the tornado struck in a built-up area engineers were able to make the first systematic measurements of the effects of those winds on a number of different types of construction, information that contributed to the later development of the Fujita-Pearson scale(2). 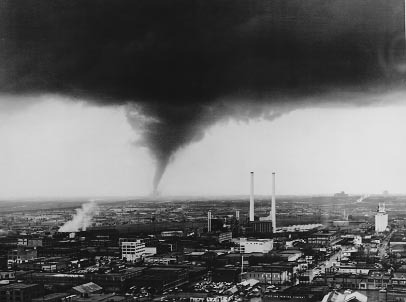 The 1957 Dallas tornado marked the first major quantitative success for modern scientific research into one of nature's most incredible phenomena, research that has saved an untold number of lives and that continues today with mobile Doppler radar and other sophisticated weather instrumentation which can be moved quickly to sites of severe storms. 2007 represented the 50th anniversary of this important meteorological event. This web site was assembled to commemorate that anniversary. On April 10, 1957, many newspapers around the nation carried this AP piece quoting Weather Bureau meteorologist Robert G. Beebe, who was to go on to prepare the Bureau's official report on the tornado. The talk about tornado control and the over-stated wind speeds probably are testimony more to the immediate excitement the storm caused among the meteorological community and to the state of tornado science at the time than to anything else (this clipping is from the Newark Advocate). (1) At least two other tornadoes had briefly been filmed earlier in the 1950s. (2) About two and a half months later, on June 20, 1957 an equally famous tornado -- an F5 -- killed 13 people in Fargo, North Dakota. Dr. Ted Fujita did landmark research on this storm in preparation for his later development of his eponymous tornado severity scale. The Fargo and Dallas tornadoes of 1957, taken together, mark the advent of modern tornado science.